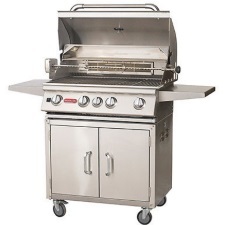 The funniest comment we found about this grill was an Amazon shopper who stated, “this was my midlife crisis grill.” One look at this impressive piece of machinery, not to mention the price-tag, you’ll understand why. The Bull Outdoor Products BBQ 44000 Angus 75,000 BTU Grill is bursting with power while offering a substantial cooking area for a total of 810 square inches. While the grilling bells and whistles are impressive, the 44000 Angus also looks fantastic. Made of stainless steel, the design will literally change the look and feel of your patio and/or backyard. Can’t get any better than that! If you’re a stainless-steel fan, look no further. Constructed from 16 gauge 304 stainless-steel (among the highest stainless-steel grades), this grill can survive just about anything. Needless to say, rust and corrosion will never be an issue. The hood is dual lined which means it is highly effective at trapping heat inward, and the steel grates are also, you guessed it, stainless-steel which transfers heat more effectively to your prized grilling ingredients. Standard and gourmet grills differ from each other in several ways. One area is the rotisserie/back-burner that a gourmet grill like the Bull Outdoor Products Angus grill features which allows the grill-master to slow cook a range of meat. A chrome plated rod and spit can skewer any chicken you present it, and couple this with an interior lighting system, night BBQs will not be comprised by lack of light which is great news for the chef and patrons alike. This Bull Outdoor Products Grill churns out 60,000 BTU’s (4 burners each running 15,000 BTU’s). Stainless-steel design with Piezo igniters. State of the art thermometer built into the hood coupled with a twin lighting system. 600 square inches of cooking area plus 210 square inches for a warming rack. Weighs in at 225 pounds and LP models include a hose and regulator. In summary, the Bull Outdoor Products 44000 Angus Grill is a fantastic grill for seasoned, grill-aficionados. Probably not the best bet for a newcomer but if you have grown weary of the standard BBQ, this is a step up. Think Hyundai versus BMW (and not the top of the line Hyundai). This grill also looks fantastic, which was mentioned repeatedly. A solid bet and one that will last a while.